There's a minimum recommended internet speed for streaming video from websites and services, such as Netflix, Hulu, Vudu, and Amazon. In order to have smooth standard definition video, it's usually recommended to have a connection that is more than 2 Mb/s. For HD, 3D, or 4K, that speed is much higher. It's also different depending on the service that's dishing out the videos. Netflix will automatically adjust the quality of video to your internet speed. If Netflix determines you have a slower speed, it will not stream high definition quality video, even if the movie or TV show is available in HD. This limits interruptions and buffering of the video but the picture quality will suffer. 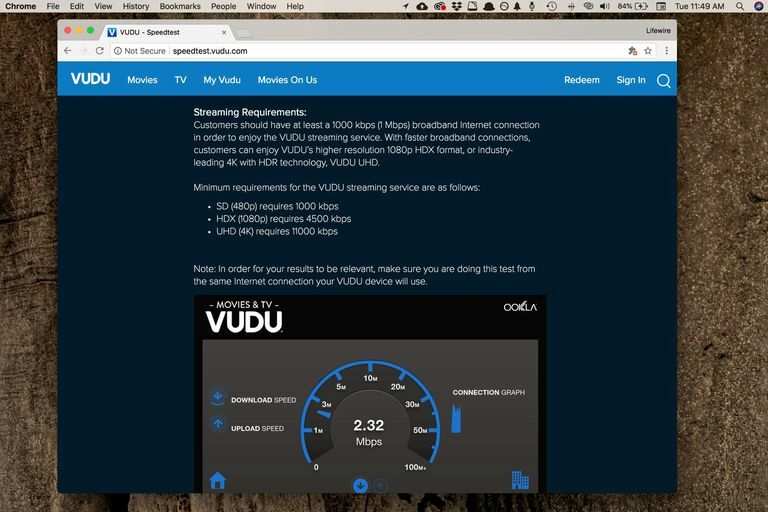 Vudu offers a test to see if a higher quality video will play on your media streaming device. If a video halts and buffers repeatedly while you are watching it, a message will appear asking if you would rather stream a lower quality version. It is not limited to broadband/cable internet. In some cases, internet speeds nearing 100 Mb/s from a DSL internet connection may be available. Some providers offer very fast DSL speeds via Fiber Optics, while some cable providers offer 30 Mb/s or higher. Google Fiber serves 1 Gb/s (one gigabit per second) speeds. These ultra-high speed connections can handle just about any video we have available now, and much more. Other Gigabit services include Cox Gigablast, AT&T Fiber, and Xfinity. You can quickly check your internet speed using one of the internet speed test websites. However, be aware that these tests might not be accurate if there are other factors contributing to a slow network. There's more on that in the next section below. Netflix has its own speed test at Fast.com that lets you test the speed of your network with Netflix. This is the best test to take if you're planning to subscribe to Netflix because it tells how well you can download content from their servers. While your internet speed caps out at what you're paying for, other things can affect that speed too, such as the devices you're using. If you have an old, hardly-working router or modem, or laptop or phone, it's harder to utilize all the bandwidth you're given from your ISP. If you're having issues streaming online videos to your laptop, you can try to boost the strength your network's WiFi signal, or disconnect from Wi-Fi and use a physical Ethernet connection. It's possible that the Wi-Fi signals are weak in that particular place in the building, or that the device is being interfered with by other wireless signals. If your network bandwidth is shared between every other device on your network. If you have an 8 Mb/s internet speed and four other devices, like some desktops and laptops, and a gaming console, and if they are using the internet at the same time, each of them can may only download at about 2 Mb/s, which is hardly enough for SD content from Hulu. If you're having trouble with buffering and videos neglecting to fully load and boosting your WiFi signal or the Ethernet connection option doesn't solve the problem, stop using your other devices - you are probably putting to much demand on your home network. If you are having video streaming issues, don't be downloading things on your laptop and be on Facebook on your phone while you stream videos from your Xbox. It's just not going to work out very well. The best way to avoid problems with low quality, slow loading, and buffering, as well as ensuring you meet all the speed requirements of the services you want access to, is to make the financial commitment to secure the fastest internet speed available in your area that you can afford.